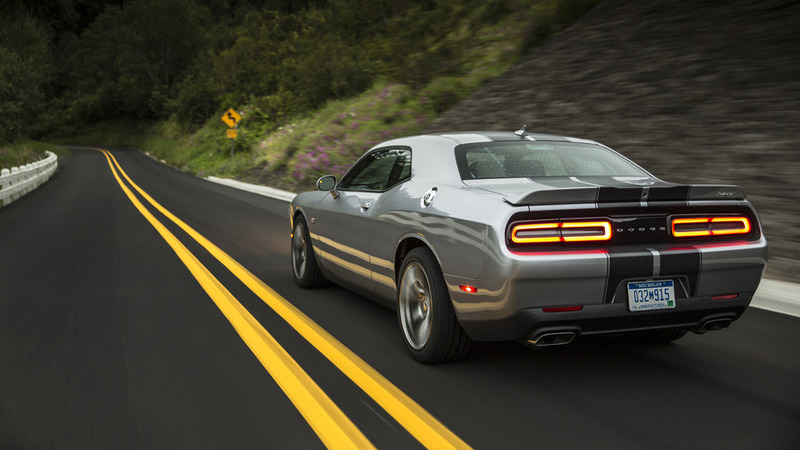 The Challenger may be a perennial third-place finisher in the U.S. Pony Car wars, but it doesn’t lack for personality. Some of that verve is down to the car itself: a big, old-school muscle car that’s just as happy lub-lub-lubbing its way down Main Street on a Sunday drive as it is takin’ slips and pickin’ up chicks at the local drag strip (a sports car it is not). And some of my interest in the car regards the high-volume of variety in how it can be ordered. After the recent New York Auto Show, there’s a new top dog in the world of Mopar, the 840-horsepower Demon (illegal or not). But don’t forget about the new-for-2017 Challenger T/A 392. (The “T/A” pays homage to the brand’s 1970s racers in the Trans Am series, if you were wondering.) 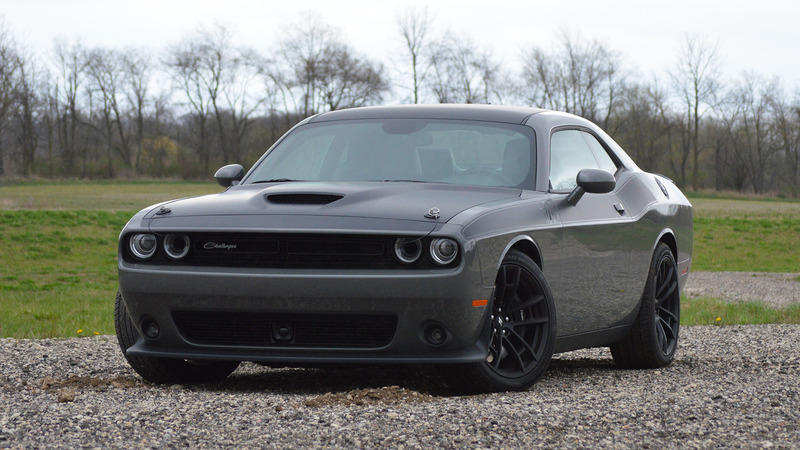 The T/A 392 seems to slot into the lineup two rungs down from the ultimate firebreather, and one from the Hellcat, but I’m willing to argue that it might be a better car to own than either. If you think 485 horsepower is too light… You’re either wrong, or I’m not fit to carry your helmet. 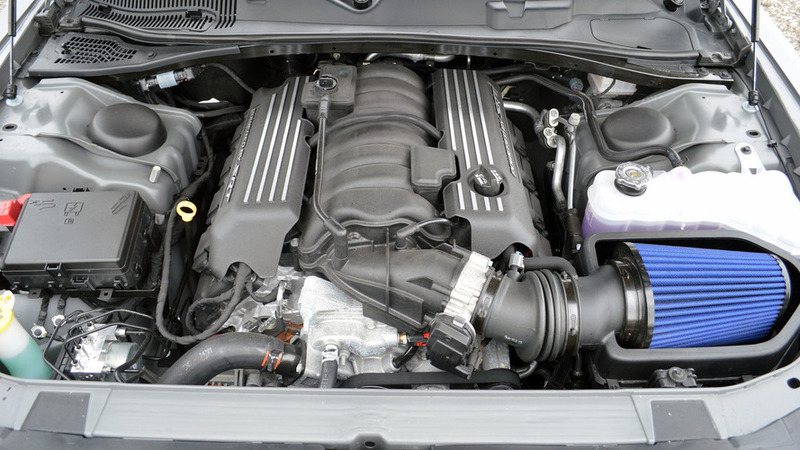 The 392 Hemi V8 – that’s 6.4 liters of naturally aspirated glory – puts nearly 500 hp and 475 pound-feet of torque to the Challenger’s rear tires, and it does so in a hurry. Floor the throttle from a standstill, and you’ll see the tach needle swing right a lot faster than the 275-section Pirelli tires can fully adhere to the pavement. Using the timer app baked into the Uconnect software, I saw easy 4.9-second pulls to 60 miles per hour. With more attention, less wheelspin, and a stickier stretch of asphalt, I’m sure that low fours are feasible. There isn’t a bad transmission. My test car was optioned up with the eight-speed TorqueFlite automatic transmission, though this package can be had with a six-speed manual, as well. If I were the one coughing up a down payment, my car would have three pedals, but in fairness I don’t mind this automatic in the least, either. 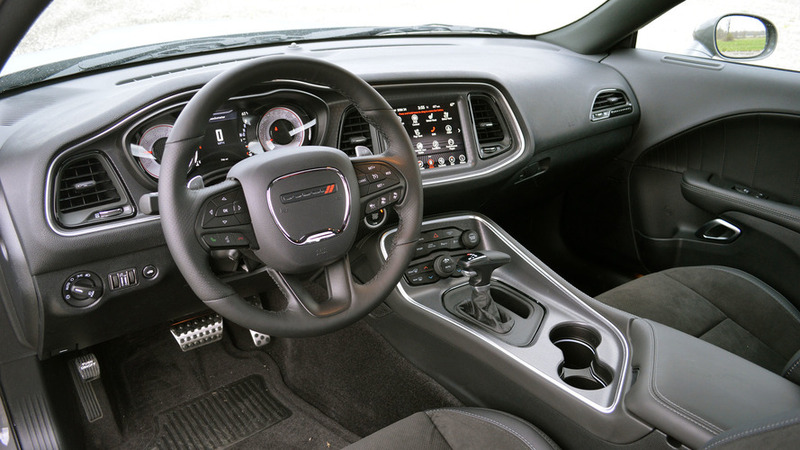 There’s so much torque on hand that you never really feel out of sorts relative to the gear you’re in, and the stubby paddle shifters are there if you’d like to drop a gear and make the Hemi howl. Two-door looks, four-door fit. The disadvantage of making your coupe on a large sedan platform is that it gets kind of porky (read more below). But the flipside is that big/tall guys like me fit really comfortably in it. The Challenger is an easy cruiser, and one with willing backseats as long as the driver and passenger aren’t leaning too low. Hood pins! That’s it, I just like the hood pins, and the fact that you can order them from the factory. They make the car look mean, seem relatively robust of construction, and draw attention from high school kids – what else do you want your car hood to do for you? This ain’t no Camaro in the corners. I know a guy in L.A. who routinely tracks his Challenger (in fact, he’s just upgraded to a Hellcat); it’s an act I find admirable, yet puzzling. For all that this Dodge comes together for me when charging hard down a country road, I know that corners are going to have to be very well thought out, or rather slow. Chevy and Ford have the Pony Cars of choice where handling is concerned. 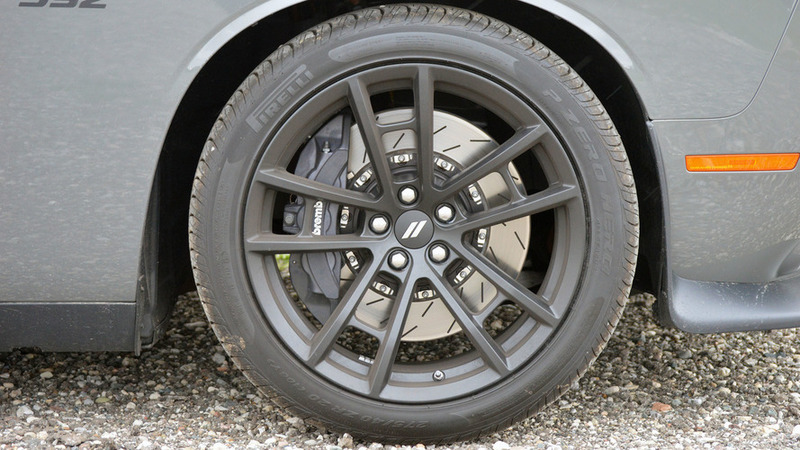 Even in this T/A form, with more aggressive tires, a lowered ride height, and Bilstein dampers, the Challenger doesn’t feel light or pointy in corners. She’ll make the turn, but not without some body roll and a couple of ad hoc prayers under my breath. The interior is rather, eh, one note. While I find the confines of the seats and seating position to be quite comfortable, the view forward in the Challenger is dull, bordering on depressing. 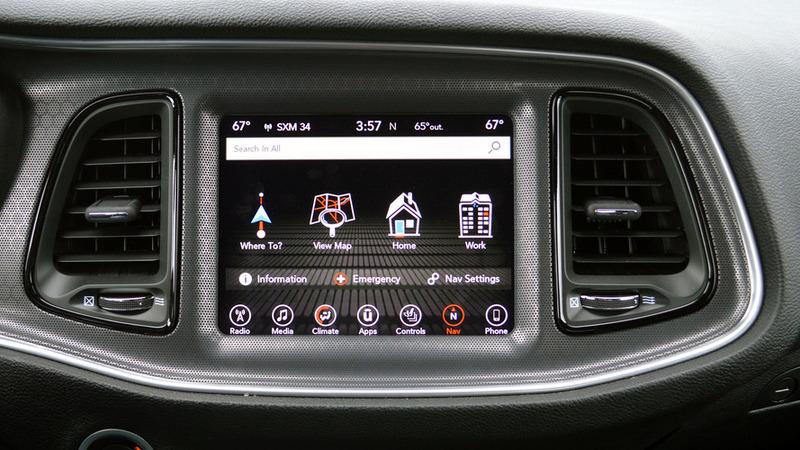 The dash is huge, number one, and all of it seems to be formed from the rubberized black plastic that other carmakers use on the inside of grab handles, or bottoms of console storage. Having that big, bright Uconnect screen does liven the space up somewhat, but there’s no fix for the dust that the acre of rubber grabs and holds. How long will this trim and tape last? I like the heritage look of the black stripes, and the matte black roof and hood, quite well. But little details like the fact that the “392” is a sticker, not a badge, seems overly cheap for a car in the $50,000 range. The examples that aren’t babied by owners could end up looking beat up quickly.